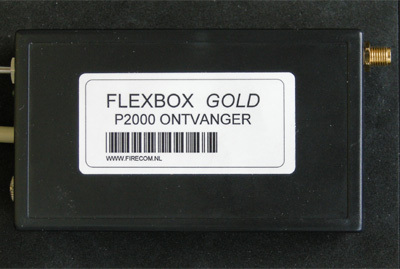 The Flexbox Gold is a single channel P2000 receiver including a 2 level interface. Versions of this receiver for KPN Nationaal 3 and ASTRID paging ('Blackbox Astrid Data-ontvanger') are available as well. Some PCs are not equipped with a serial port. To use the Flexbox Gold on such a PC, you can equip it with a discriminator output. This enables the receiver to be used in combination with your PC's soundcard. The Flexbox Gold uses a TK31145 receiver IC. The unfiltered audio can be found on pin 9. This pin has a connection to a solder pad nearby, so that you don't have to solder to this miniature IC. A 1 k resistor is connected to the indicated solder pad. The resistor's other lead is connected to the negative lead of a 10 uF, 16 V electrolytic capacitor. 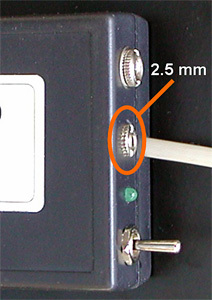 The power supply of the Flexbox Gold uses a 3.5 mm plug. To prevent an expensive mistake, a 2.5 mm socket or alternatively a cinch socket can be used for the discriminator output. 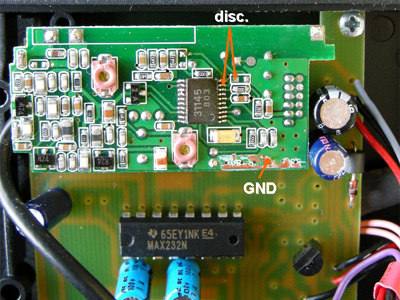 The ground lug of the socket is connected to the part of the circuit board marked as 'GND' on the picture. You will have to remove some protective lacquer of the PCB. 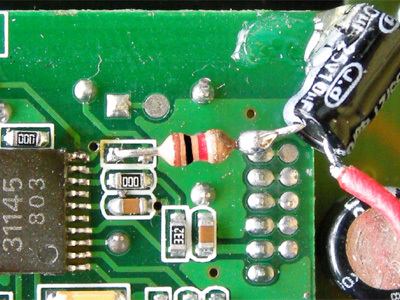 De other lug of the chassis socket is connected to the positive lead of the 10 uF capacitor. Watch out: performing this modification will void the warranty of your Flexbox Gold. You can avoid this by having the modification done by Van Dijken Elektronica or through discriminator.nl. The Flexbox (and its variations for other paging networks) is available from Van Dijken Elektronica with an optional discriminator output.